Zombies, ghouls and scary spooks danced through the campus of a specialist Shropshire college for some frighteningly fun ghostly goings-on for Halloween. 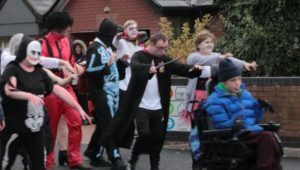 Students and staff from Derwen College, near Oswestry, were invited to dress up in Halloween outfits to perform Michael Jackson’s Thriller for the national Dance for Dignity campaign. The event, which will be edited into a film, involved screams of laughter more than fear but had an underlying serious message to highlight dignity in care. The students and staff performed the moves to Thriller down a path lit up with Halloween pumpkins that students had made during the week. Other fun Halloween activities included prizes for the best pumpkin carving created in Independent Living Skills classes. The college also ran a special Halloween pumpkin soup offer for visitors to its Garden Café, and organised a Halloween charity quiz to raise funds towards the college’s new hydrotherapy pool. Helen Owen, Independence, Health & Wellbeing Manager, said that everyone had enjoyed working together to create the shocking showpiece. 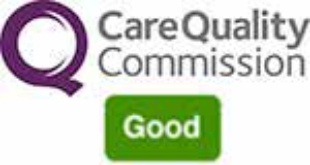 A spokesperson for Dignity in Care said: “Most of us at some point in our lives will be in contact with care services, be that in our work, as a service user, carer, relative or friend and when we do we hope we will be treated with dignity and respect. More than 88,000 Champions from all walks of life have joined forces to provide a more dignified service for everyone. Derwen College, in Gobowen, is a specialist college for young adults with learning difficulties and disabilities. The college offers students the opportunity to learn new skills in real work environments and to learn life skills which will enable them to live as independently as possible. The college has received three consecutive ‘outstanding’ Ofsted gradings. For more information on Derwen College go to www.derwen.ac.uk or telephone 01691 661234. To see the full video click here. Julie Hawkins, Head of Speech and Language, takes Santa through the basics of Makaton signing. Santa’s little helpers can glean a little extra help relating to children with communication difficulties this Christmas. Derwen College, near Oswestry, is running a signing workshop on Thursday, November 1st, ensuring that stand-in Santas and elves have no problems understanding what children want in their stockings this year. The 2.5-hour fun Makaton workshop, from 2pm-4.30pm, teaches the essential signs and symbols to make the grotto experience magical for youngsters of all abilities. The fun workshop will be run by trained Makaton tutor Julie Hawkins who will teach a handful of Christmassy signs, symbols and songs to help festive helpers communicate with youngsters with learning difficulties and disabilities. The course costs just £10. Makaton is a language programme using signs and symbols to help people to communicate. It is designed to support spoken language and the signs and symbols are used with speech. Julie Hawkins, Derwen College’s Head of Speech and Language says: “This will be the second year that Derwen College has run a Christmas Makaton workshop. We thoroughly enjoyed last year’s sessions and thought there was definitely a need to roll them out to more people this year. 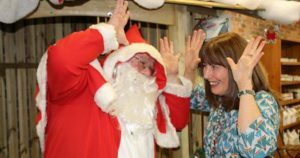 “We believe that by learning a few simple signs, every Father and Mother Christmas and would-be elf could communicate effectively with all children ensuring that the grotto experience is truly special for children with learning difficulties and disabilities. October is Work Experience Month. Former Derwen College student Mary Woodall shares her experience of work experience with Premier Inn, and how it led to paid work at Premier Inn in Greenwich. I have been employed as a Receptionist at Premier Inn, Greenwich, in south east London since November 2016, but it didn’t start out like that. This article relates to how I first managed to gain some work experience so I could enter the world of proper employment. I was a student near Oswestry in Shropshire at a place called Derwen College, which is for young people with special educational needs. 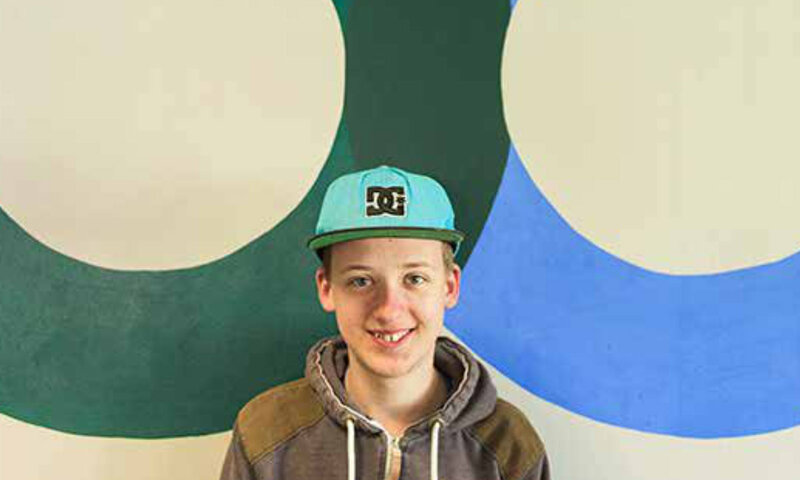 Through a scheme that was devised by the College in conjunction with Premier Inn, I was able to gain work experience and, with that, the confidence and skills to make the transition from being a student to paid employment. It took me several years but eventually I got there. The scheme that I am on, started in 2013 when Premier Inn got together with Derwen College to create a training experience involving work areas including: Service and serving food to customers; Reception and front of house; and House-keeping. Once this was done, Derwen decided to create their own ‘Premier Inn work experience area’ enabling the students to practise these skills before going offsite to do it in real life. Premier Inn fully supported this initiative. I had already had trial work experience in the Reception area at college when a team from Premier Inn was visiting the College, I took the initiative to ask if I could have work experience at a real Premier Inn Reception. After some consultation with the management, itwas agreed that they would take me on Reception at a Premier Inn in Chester. When I started at Premier Inn, Chester, initially I had support from a job coach with travelling and so on, but after a few months I was able to gain enough confidence to get to work independently. Initially I started doing morning shifts and progressed to evening shifts. In 2016 I graduated from Derwen College and I moved back home to the Greenwich area, in south east London. I was enjoying my work experience at Premier Inn located in Chester and, if possible, I wanted to continue at another branch of Premier Inn when I moved back to London. So the area manager for Premier Inn Chester contacted the area manager responsible for my part of South East London and I was able to continue my work experience at Premier Inn, located in Greenwich. I believe that I was one of the first students from Derwen to join the Premier Inn work experience scheme (and the only one to work on reception). After a few months on work experience at Premier Inn, Greenwich, they offered to make me an employee, so since November 2016 I have been in paid employment (by the end of November there will be 17 former students in employment with Premier Inn). My work on reception involves greeting the guests when they arrive and either I enter all their details on the computer or I assist the guests in the Kiosk where they can enter their own details. I’m pretty talkative and I enjoy chatting to the visitors when they arrive. Greenwich is a UNESCO World Heritage site and so we have many visitors from overseas, especially from Spain, coming to our Premier Inn, Greenwich, to look at the famous historical buildings such as the National Maritime Museum and the Royal Naval College. I also provide maps and tourist information to visitors about Greenwich and London generally. I have several colleagues at Premier Inn Greenwich. I work a lot with Nanna and Linda, and sometimes with Amber as well. We all get on well together and we know it’s important to give the guests a big welcome because first impressions really do count and we want our guests to enjoy themselves and feel welcome. Being employed at Premier Inn has taught me important skills: to be punctual, time keeping and to have a smart appearance and make a good first impression; how to deal with all sorts of people and visitors to the hotel. Overall this has been a great scheme for me and I’m really glad that I had the opportunity to do it. I am very grateful that Premier Inn were able to devise and run a scheme like this for people like me. I would like to thank the team at Premier Inn for giving me this opportunity. And, of course, I hope I’ll be able to continue at Premier Inn, Greenwich. Thanks to Rees Astley for raising funds through ‘scare tactics’! Becca Dean from Rees Astley Insurance Brokers handing over a donation of £264.38 to students Jamie Bullock, Alexander Thomas and Sam Innes. Challenges involving spiders, slime and a zebra-print sofa have helped a Shrewsbury-based firm of Insurance Brokers to raise more than £250 for Derwen College, near Oswestry. Rees Astley Insurance Brokers, whose offices are located in Sweetlake Business Village, ran ‘I’m a Celebrity’-style Bush Tucker Trials at Shropshire Oktoberfest. 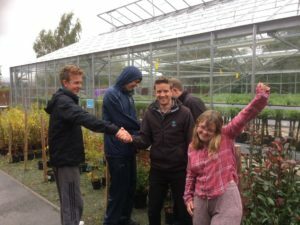 The challenges raised funds towards new health and leisure facilities for students at the college for young adults with learning difficulties and disabilities. Students Jamie Bullock, Alexander Thomas and Sam Innes visited marketing assistant Becca Dean at the Rees Astley Shrewsbury office to thank her and the team for their hard work and support. Becca Dean said: “It was our second year at Oktoberfest, and we made the decision to go bigger and better than last year, launching the Rees Astley Bush Tucker Trials – as sometimes Insurance can be a jungle! Derwen College, in Gobowen, is a specialist college for young adults with learning difficulties and disabilities. The college offers students the opportunity to learn new skills in real work environments and to learn life skills which will enable them to live as independently as possible. 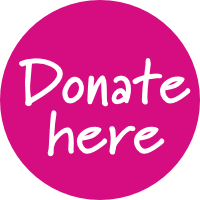 Derwen College is raising money towards a new hydrotherapy pool as part of the college’s fundraising campaign for the Therapy and Fitness Centre project. Derwen College students took part in student elections this week, making speeches and pledges in the hope of being voted on to the college’s Student Union Board. Students from each department, including first year ‘freshers’ who have been at the college for less than a month, stood up and appeal ed to colleagues for their votes. Elected student reps and deputies were announced to resounding applause. The chosen reps and deputies will represent their fellow learners for the next 12 months. 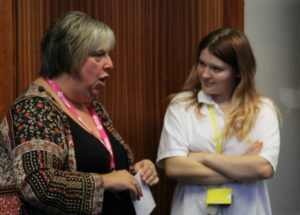 Sarah Laszlo, Learner Voice co-ordinator, said that all the students who took part in the election process should be very proud of their contribution. She said to students: “Congratulations to everyone who stood today. It’s a really tough job to stand here and talk and everyone has done an amazing job. Sarah paid tribute to the new first year students. Sarah also thanked everyone who helped with the Student Union Board elections through supporting students with their speeches, building confidence, getting learners to their voting sessions and supporting those who didn’t make the final team. Derwen College is committed to giving students a voice in the running of the college through Learner Voice. Learner Voice work encourages many skills including discussion, negotiation, decision making and problem solving. Student Union Board members and Student Union Officers are elected through democratic processes across programme areas every October. The Student Union Board meet regularly to discuss issues, suggestions and ideas raised by students, and meet termly with the college’s Leadership Team. Sarah Laszlo congratulates new freshers’ rep Carys. Retail Studies rep Sian with deputies Bethan and Taylor. Land-based studies rep and deputies celebrate election success. 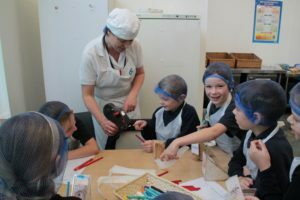 Pupils from Morda CE Primary School visited Derwen College, in Gobowen, as part of their Eat Well Week this month. 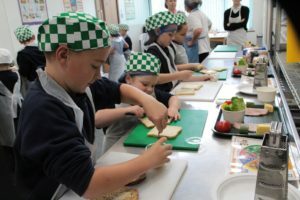 The school’s ‘Rockies’ class visited the college for a practical activity to prepare a healthy snack with Derwen College hospitality students and staff. Eat Well Week took place between Monday 1stand Friday 5thOctober. 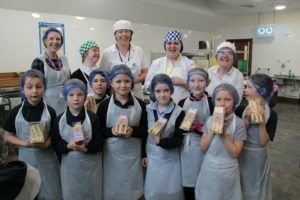 The week was part of the Morda Living Well project when pupils took part in lots of fun and enjoyable activities as they learned about keeping themselves healthy by eating well. 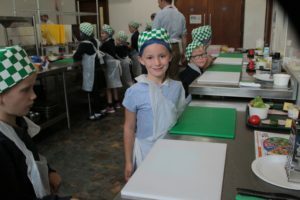 There were a variety of activities going on, pportunities for trying new tastes, as well as trips out for some classes and visitors coming to school to cook and bake with pupils. 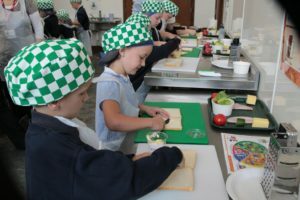 Rockies learned about the Eat Well Plate at Derwen College as well as preparing a healthy snack with the students and staff. 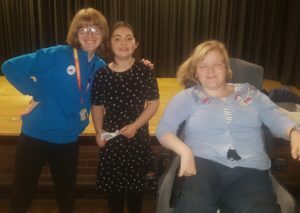 Ahead of the visit, Derwen College Student Voice co-ordinators Sarah Laszlo and Sue Richards delivered disability awareness training to the whole of Morda school during their morning assembly. Fundraiser Anna Evans and Commercial Development Manager Pete Evans took a Derwen College pop-up market stall to the school. Sales of home-made jam, chutney, cakes, and breads created by hospitality students, as well as plants from the Garden Centre, did a roaring trade, sales raised more than £80 for the college. Derwen College, in Gobowen, near Oswestry, is a specialist college for young adults with learning difficulties and disabilities. The college offers students the opportunity to learn new skills in real work environments and to learn life skills which will enable them to live as independently as possible. Hospitality and Customer Services is one of the core vocational areas at Derwen College. 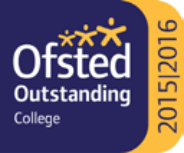 The college has received three consecutive ‘outstanding’ Ofsted gradings. For more information on Derwen College events and leisure facilities visit www.visitderwen.co.uk.